The commander in charge of American nuclear missiles, submarines, and bombers is concerned by the slow pace of modernizing aging U.S. weapons in the face of growing threats from China, Russia, and North Korea. Stratcom commander Air Force Gen. John E. Hyten also said information warfare—the use of information operations, cyber, space, and other capabilities—is emerging as a form of strategic warfare. "Information warfare in the future is the key to military dominance and control," Hyten told the Washington Free Beacon in an interview. "The military that figures out how to control information will be the most powerful military on the planet," he said. Currently, Russia and China have developed significant information warfare capabilities involving the use of political, legal, media, intelligence, psychological, and cyber warfare means to achieve strategic objectives. China's operations can be seen in covert efforts to take over the South China and East China Seas. Russian information warfare, also known as hybrid warfare, was used in the takeover of Ukraine's Crimean Peninsula. By contrast, the United States is just beginning to develop effective information warfare capabilities, both military and civilian. A report by the Army War College states that adversaries are using influence, intimidation, coercion, and aggression against U.S. interests. "So far, the United States has not come up with a coherent countervailing approach," the report on what the Army calls "gray zone" conflict states. On modernizing aging nuclear forces and infrastructure, Hyten said current U.S. nuclear weapons and forces are sufficient to deter foreign adversaries. But all the systems, including nuclear warheads, urgently need modernizing and quickly. "My biggest concern is the ability to go fast enough," Hyten said. The modernization will take between 12 and 18 years depending on the triad of systems—land-based intercontinental ballistic missiles, submarines and missiles, and nuclear bombers. Congress' Government Accountability Office estimated this month that the Pentagon and Energy Department will spend $341.8 billion over 10 years on nuclear modernization. The costs include $40.5 billion for nuclear command and control, $107.8 billion for the nuclear weapons stockpile and infrastructure, and $193.5 billion on nuclear delivery systems. Key decisions on which systems will be built and how fast will be part of a Pentagon study currently underway called the Nuclear Posture Review. The review is expected to be completed later this year. By contrast, Russia, China, and North Korea are rapidly modernizing their nuclear forces faster the U.S. is, Hyten said. Hyten said he understands the challenges of deciding what to buy, getting funds from Congress in a timely manner, and following an effective acquisition plan. "But I just keep pointing out the fact that this is not new technology. This is not pushing the state of the art in many ways," he said. For example, Hyten said that in five years beginning in the late 1950s, the Pentagon built and deployed 800 Minuteman I ICBMs at five bases in new silos, and created new command and control systems. The cost in current dollars was $17 billion. "So how is it that we could do it in five years back then?" Hyten asked, recognizing that it was during the Cold War and there was a need. Hyten said the American private sector has shown speed of development, noting commercial space developers Space X and Blue Origins and Apple and Google on the technology side. "We can go fast in this country. So somehow we need to get that focus on the need to go fast. And the other thing is when you go fast, you end up being a little more efficient with the taxpayers' dollars too, which is a good thing," he said. Key nuclear delivery systems to be built include new Columbia-class missile submarines, a new ground-based ICBM, and the B-21 bomber. 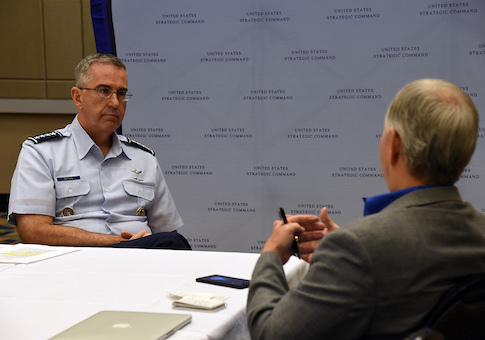 Hyten said during his tenure as Stratcom chief the force will be robust. But future Stratcom commanders could find U.S. deterrence lacking. Meanwhile, America's adversaries are rapidly modernizing nuclear and strategic forces. Russian nuclear force modernization includes a rapid buildup of several new missiles with multiple warheads, missile submarines, and bombers. Moscow has announced the force will be 70 percent upgraded by 2020. Moscow is spending $560 billion on the modernization. "Whether they get there or not, I won't comment on, but that was a stated objective, and I'll just point out that in 2020, we'll be zero percent modernized," Hyten said. "So you have Russia going fast, North Korea is going extremely fast, China is going fast across a number of things, not just the nuclear capabilities, but in space where they are aggressively pursuing counterspace capabilities; in cyber space, where they are aggressively pursuing very modern cyber capabilities," he added. North Korea on Friday conducted the second test this month of a new ICBM the Pentagon is calling the KN-20. The new missile was called a "game changer" by Army Gen. Vincent Brooks, commander of U.S. Forces Korea. China has been conducting military exercises with their nuclear forces that integrate both space and cyber attacks as part of an overall strategic deterrent. "It's all one to them," Hyten said. "The threats are right there and that's why we have a Strategic Command to respond to those strategic threats," he said. "And that's why modernization is important, not just the triad, but the nuclear weapons, the nuclear command and control, space, cyber." The four-star general made the remarks on the sidelines of Stratcom's annual deterrence conference in Omaha, Neb., where Stratcom's headquarters is located. Modernizing nuclear weapons will require fixing an aging infrastructure and maintaining a workforce that has weapons to work on. Hyten said he currently does not need new nuclear weapons that many experts say could make U.S. nuclear weapons more effective and safer. Most current nuclear weapons are more than 20 years old and have undergone upgrading. "But I have to have a nuclear weapons enterprise that continues to produce the nuclear weapons and maintain the nuclear weapons I need and the next 10 Stratcom commanders need in order to provide that capability," he said. "So there has to be work done in modernization of the nuclear capabilities. I want to do that in a way that does not require testing. That creates a significant challenge for the laboratories as well." U.S. supercomputers operated by the laboratories could be used for weapons development and simulated testing, he said. On information warfare, Hyten said he is concerned by the lack of integration within the United States on the information front. "You have intelligence here, cyber here, space here," he said, noting that all are information-based domains for military conflict. "So the ability to control the information is going to be the key to conflict in the future," he said. Hyten said he believes there are going to be "continuing changes" within the military and government in organizing and dealing with information conflict. "I think as we go forward 20 years from now they'll be a continuing merger of information together," he said. The Air Force has been looking at information warfare for some time but the subject "just never reached the point where the service was culturally ready for it." Both cyber warfare and space defense have not been fully embraced by the military as new war-fighting domains, he said. "Space has been around for 35 years now, I mean there's been an Air Force Space Command for 35 years, and we have not fully integrated space as a war fighting domain that we operate in," he said. That is changing under policies put in place recently by Defense Secretary Jim Mattis and Gen. Joseph Dunford, chairman of the Joint Chiefs of Staff. Cyber too has not been fully embraced as a new realm for war fighting. "We don't like to think of cyber as a war fighting domain, and therefore we have all kinds of special rules that we put into it. We have to start treating them as war fighting domains and operating in them as war fighting domains," he said. Hyten said information is "the key piece of the puzzle." "Treating information as a war fighting element that control of is critical to the future," he said. "And as you do that, I think those kind of pieces will come together, especially in terms of integrated operations." Hyten said he has long advocated that organization structures are less important than melding new forms of warfare into current plans and strategies. "The organization isn't the most critical thing," he said. "The most critical thing is the way you actually integrate to fight. And we have to look at information as a critical element of a future conflict." A former chief of Air Force Space Command, Hyten also said he is concerned about the military's aging satellites and other space capabilities. "They are very old and not built for a contested environment," he said. Both China and Russia are building space weapons to kill or cripple U.S. satellites—key asymmetric warfare capabilities used for weapons guidance, intelligence and communications. To bolster space defenses, space needs to be treated as a war fighting domain, Hyten said. "It's not very complicated," he said. "You treat it as a war-fighting domain. It's a war-fighting domain and therefore you treat it as a war-fighting problem. And when you do that, the answers are not that complicated." The military needs to have better capabilities for satellites to maneuver to avoid missiles, lasers, or killer robot satellites. Additionally, the military needs better space defenses. "We have to have defensive capabilities to defend ourselves [in space]," Hyten said. "These are just war fighting problems, but for some reason we hesitate to think about space in a war fighting construct. But you have to, and when you do you actually can figure out a way to preserve the peace because we don't want a war extended in space." "But just like every other domain, the best way to prevent war is to be prepared for war," he said. "So that's what we have to do. Walk down that path." Hyten said both China and Russia have threatening space warfare capabilities. "China right now is ahead of Russia because they've been on a consistent path for a longer time," he said. Russia, however, has had anti-satellite weapons since the 1980s and has slowed its effort. "So I would put China a little bit ahead of Russia in developing those capabilities but that's just a matter of time. They're both threats," Hyten said. Hyten also said he is concerned about Russian compliance with the New START strategic arms treaty. According to the State Department, Moscow currently has deployed 1,765 warheads—215 more than the limit allowed by the 2010 treaty that must be met by February 2018. By contrast, the United States is currently under the New START warhead limit with 1,411. Pentagon officials revealed last year that Moscow is doubling the number of strategic nuclear warheads through deploying multiple warhead missiles. "In a deterrent construct, parity is actually a good thing, and understanding where parity is with Russia is important," Hyten said. "And the New START treaty helps us define that, which helps me as the commander of Stratcom to make sure we have an effective deterrent that can respond to any threat that Russia can have. If that doesn't exist then it becomes a much more difficult problem. So yeah, I'm concerned." Hyten also voiced worries about the development of ultra-high speed maneuvering vehicles known as hypersonic missiles. "The United States is pursuing hypersonic technology, as Russia is. China is also pursuing hypersonic technology. Hypersonic technology is concerning to me, but it's really no more concerning to me than any cruise missile technology, any ballistic missile technology," he said. This entry was posted in National Security and tagged China, Cyber Security, Military, North Korea, Russia. Bookmark the permalink.